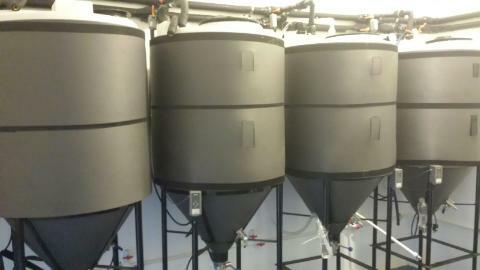 Yup, this is a forthcoming brewery on an island in the Caribbean. Hola, amigos! I just returned from Cancun and the immensely popular, laid-back island of Isla Mujeres — just a short ferry ride from the hotel zone in Cancun. Prior to my arrival, as usual, I feverishly studied the things we might want to do in the few short days we were there. 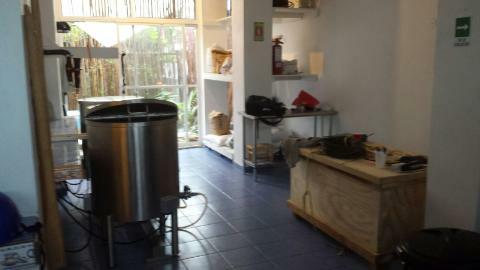 In my research I found some information about a new brewery set to open soon on Isla Mujeres. This is a big deal, because it’s very difficult to get craft beer anywhere in the islands/Caribbean. Hoping to use my beer-writing persona to my advantage, I made several attempts to contact the owner for an early preview of his brewing operation. Unfortunately, I was never able to get in touch with Isla Brewing Company’s owner, Jeff McGahee. Following a festive ferry ride complete with entertainment (a singing dude with a scratchy speaker and a microphone), we stopped at traveler favorite Bally-hoo for some fish tacos and giant, potent margaritas while we contemplated our day-trip island strategy. By far, the most popular transport around the island is by golf cart, so we decided “when in Isla” and rented our cart for the day. The views are amazing and you can’t get lost because it’s only one main road around the island. I had my must-visit spots all marked on my map and off we went. After several beach stops and tiki bars, it was getting to be time to head back towards downtown Isla Mujeres. But, first, there was one more stop on my list: The Soggy Peso. OK, yes, it’s another tiki bar. But, it is very popular with the locals, including a lot of ex-pats from the U.S. and Canada. This is low season, but the place was packed full of locals. I happened to look down next to me at the bar and saw a woman to my right had a bag of beautiful children’s books. It turns out she is the author and the bar owner’s son is the illustrator. Each page is written in English and Spanish and the book is about the adventures of their cat Thomas and his view on what it’s like to move to Isla Mujeres from Canada. Her name was Lynda Lock and I found out the book is available on Amazon. Soon, there will be beer. I’m having a great conversation with Lynda about what it’s like to live there when she pointed to the guy to her right and said, “This guy is opening a brewery.” I almost fell off my bar stool. I whipped my head around and said, “Wait, you’re Jeff?” He said yes. I told him the saga of trying to contact him, about the Crew, yada, yada, yada. So Lynda said, “He’ll take you over there and show you.” It felt like a huge imposition because this poor guy is just trying to relax and have some drinks with his buddies. But, he said, “No problem. I’ll just hop on my moped; follow me in your cart.” I could not believe my luck. It’s a small island, but we were only on a quick stop in one of Isla’s many, many bars. To paraphrase Casablanca, of all the gin joints, he was sitting in this one. Jeff was an architect in Asheville, N.C., and designed several breweries there. 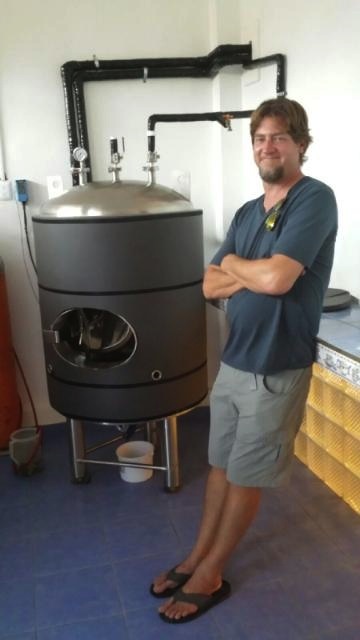 He was also a home brewer, so he figured he would combine his passions. Jeff showed us all around the small space. We peppered him with questions about the logistics of trying to start a brewery on a small island in another country. He seemed to have most of the same issues as any brewery just starting out. He said the water there is pretty good, but he does have a problem with calcium build-up “gumming up the works” from time to time. But, he said getting equipment and supplies over from the main land is fairly easy. He gets his malt mostly from Mexico City. One thing he is struggling with (most home brewers can sympathize) is his IPA. He says people on the island who try it like it, but he is not happy with it yet. Even though he is not open, there was plenty of beer ready on tap to taste. He took us through the whole lineup, a wide range of styles that actually included some dark beers — hooray, porter and stout! On an island! Ah, but this isn’t just any stout. It’s a habanero stout and it packs a serious punch. Although there is some sweetness to balance it out, which I think might have been honey, this stout is not for the faint at heart. Jeff said his intention is for people to drink it not as a pint, but as a tequila back, like you would a sangrita. After we had generous tastes of each style, one of which is an “ITA,” a very unusual India-style Tequila Ale, he told us to pick our favorite and grab a pint. The pale ale was a perfect choice. It was smooth, with enough of a hop profile to keep it interesting, and we happily savored the moment of having a pint of fresh-brewed, craft goodness on a thin spit of land in the middle of the ocean. Thanks for the impromptu tour, Jeff! Good luck! I can’t say enough about Jeff’s hospitality or his positive attitude. He said the locals have come to really respect him because he gets in there and does the hard work himself. He didn’t just come in with a bunch of money, hire cheap labor, and demand they work 24/7. He has staff, but if something happens off-hours, he says it’s his problem, and he will go fix it. The eventual plan is to have a taproom in downtown Isla as well as in Cancun. I tried to assess his frustration level on the licensing and paperwork, etc., because this has been a two-year effort so far. But he just looked at me and calmly said, “Probably early December. It will happen.” That’s life on an island, folks. If any of you ever find yourselves in beautiful Isla Mujeres, Quintana Roo, Mexico, hopefully Jeff’s place will be up and running. And, if you are like us, you will immediately start dreaming about your own craft brewing island life. Can’t wait to visit this brewery when we visit Isla again. Nice article. Can’t wait to stop over and have a beer with you and chat a little. I go by all the time where you are hard at it working but seem to always be in a rush..